You are here: Home / Blog posts / Platform: Welcome to the Spring Pop Up Shop! It’s our first pop of of the season! The new Tattoo collection is now available at the ‘Platform’ spring pop-up shop at 36 Marylebone High Street until mid May and if we’re lucky, a little longer. If you’ve had your eye on a piece for yourself, or as a very lovely present, now is your chance to come and take a look at the garments and stationary that have been floating around our social space. Come and see the brand new skirt and speak to us to find out more about each piece which can be bought from the store or reserved on pre-order. As a brand, we are committed to our customers and your opinions are important for the business to thrive. We love hearing your feedback and finding out why you prefer specific pieces, how you style them, and where you plan to wear each garment. 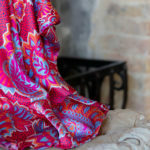 The feedback we get encourages us to diversify our range and direction and moving into daywear, following customer interest, was one of the decisions we made. We are always looking for ways to improve and expand. If you’re in London over the next few weeks, come and say hello to us. We will be here for five weeks and can’t wait to meet you this season. 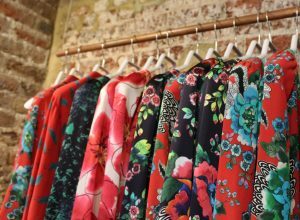 The spring pop-up shop celebrates sustainable and ethically sourced products so come and support independent designers and thoughtful fashion. « Celebrity Style – see how they work a print!